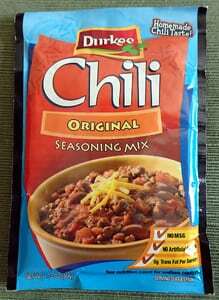 Home » Recommended Soup Making Products » What is the Best Chili Seasoning Packet Mix? The next time you’re in the grocery store and decide you’re going to make chili from one of those handy chili seasoning packet mixes, consider this: your chili and your diners are depending on you making the right decision. And that means purchasing the chili seasoning mix that will deliver the best flavor. I’m always trying to make better soup and chili. That’s why I put 5 chili seasoning mixes to the test. 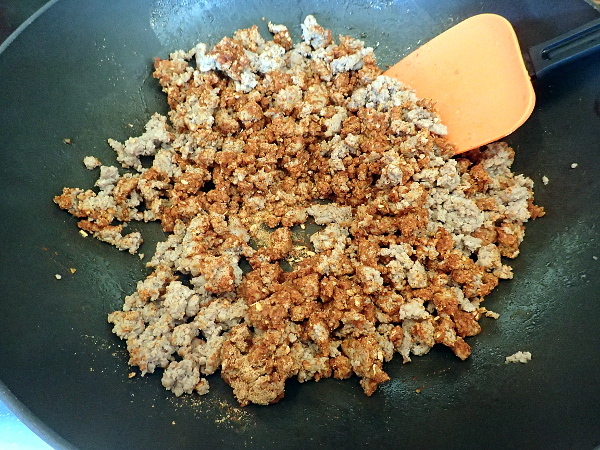 Find one chili seasoning mix to rule them all. 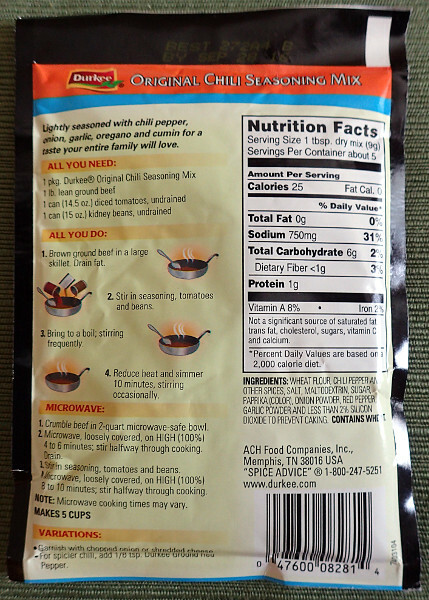 We set out to find the best chili seasoning packet mix that can be purchased locally here in Superior, Wisconsin, although most of these can be purchased across the U.S. 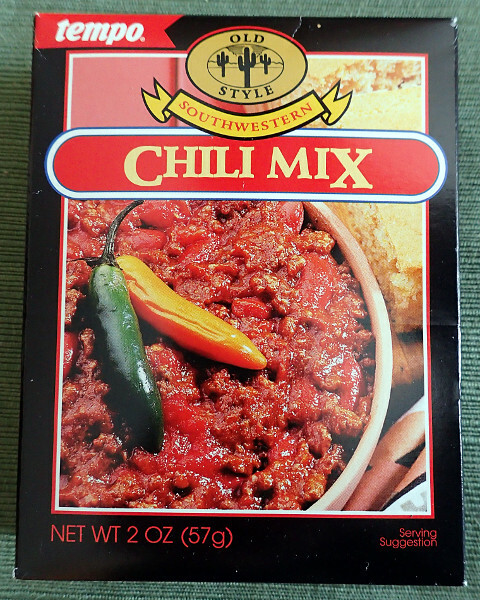 There are certainly mail-order options for chili seasoning mixes, but I wanted to treat this as if I were going into the grocery on a weeknight and relying on that selection alone. After all, when it’s dinner time we can’t be waiting for a delivery! 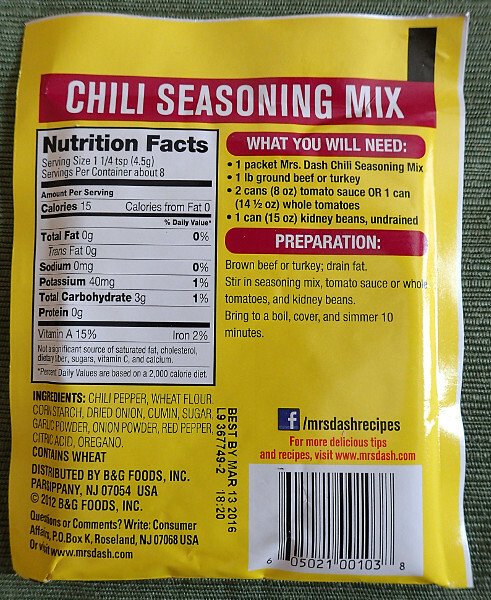 I purchased five different but common chili seasoning mixes from my local grocery store (Super One Foods). 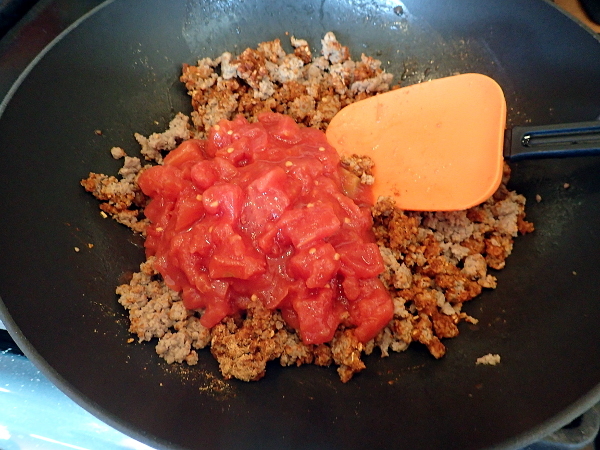 The criteria was that each mix must call for the same preparation and ingredients to make a fair comparison between the group. 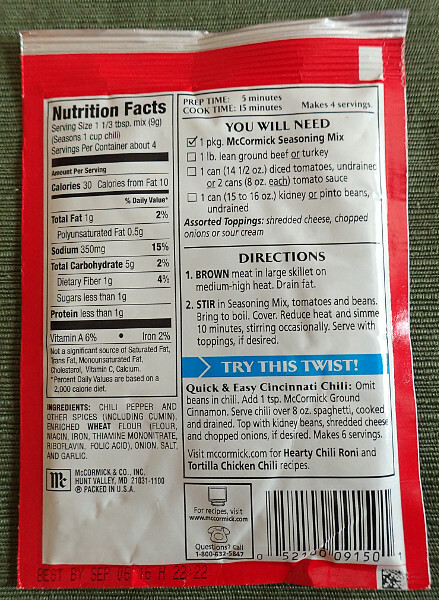 Each of these packets called for first browning 1 pound of ground beef before adding a 14.5-ounce can of tomatoes and a 15-ounce can of Kidney beans (undrained). The chili was then meant to simmer 10 minutes before serving. On a digital scale, I weighed exactly 16 ounces of ground beef for five different mixes and put the meat into individual containers to await cooking. 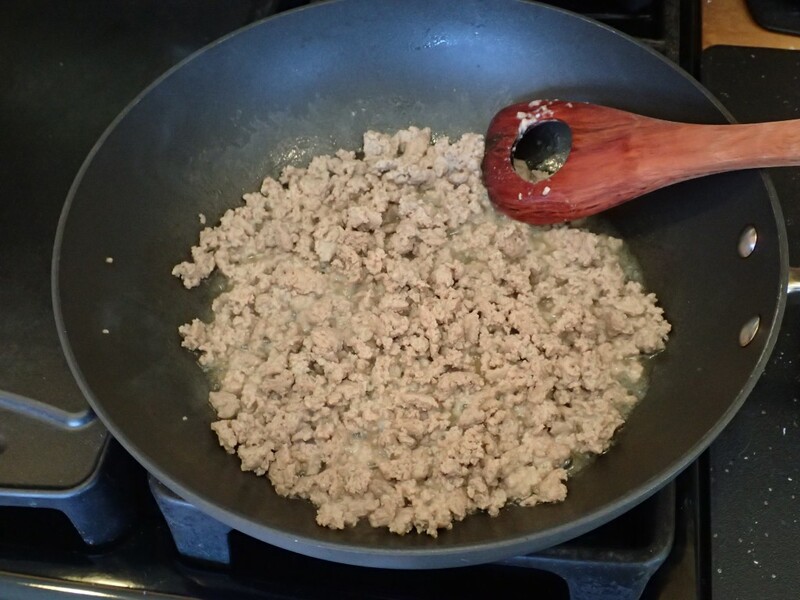 We browned the beef in a large skillet over medium-high heat and then drained off excess fat. 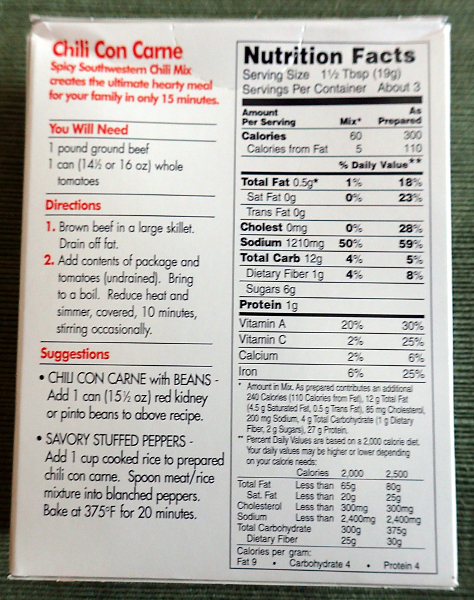 The seasoning packet contents were then stirred into the beef before adding tomatoes and beans. 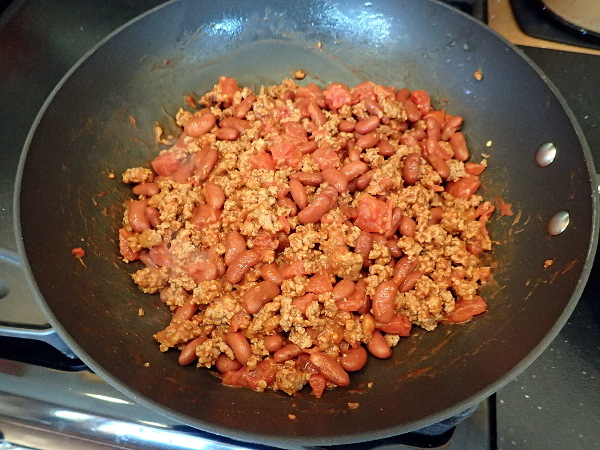 After mixing thoroughly, each chili was covered and allowed to simmer for 10 minutes. I then placed the individual chili into its own container in an electric buffet server that uses water to keep things warm. 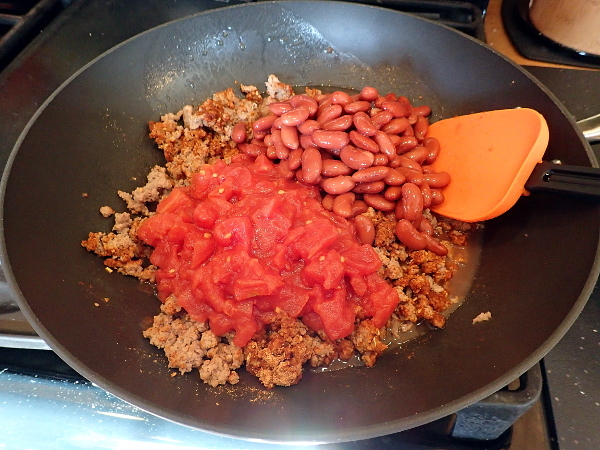 The skillet and utensils were washed thoroughly between each batch of chili to ensure there was no cross-contamination from the previous batch. This isn’t science, but I wanted to keep this comparison as objective as possible. 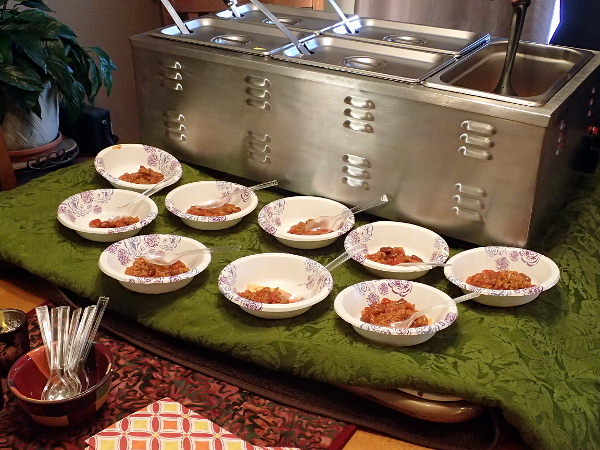 Nine Tasters rated each chili on a scale of 1 to 5, with half-scores (i.e. 3.5) allowed. 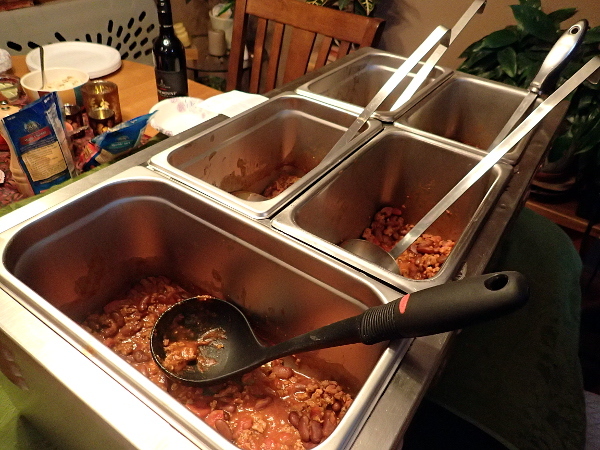 Each chili was judged “naked,” without any additional seasonings or toppings. What you see is what you get – and taste. Overall, tasters were unimpressed with this mix, with comments ranging from: “very bland” and “flavorless” to “Is there seasoning in this?” This was the only mix without salt as an ingredient, and it seems that chili without salt is a lot like other food without salt – seriously in need of flavor. Eight out of nine testers gave highest marks to French’s and Durkee’s chili seasoning mixes, with each tallying a final average of 3.4 out of a possible 5. 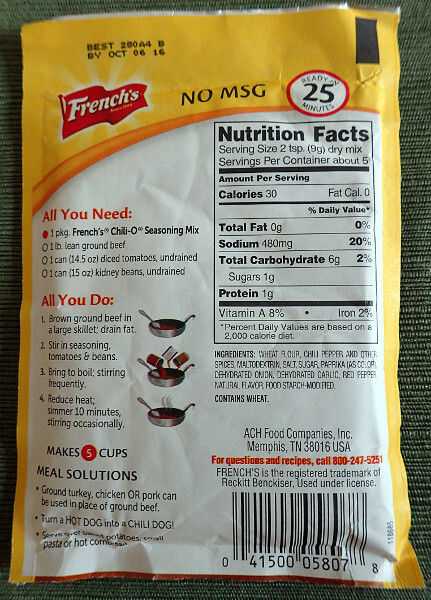 French’s received three ratings of 4, the only mix to do so, and with only one judge giving it a a score lower than 3, who said it had a “bit more spice but lacks body.” Three tasters described French’s chili as “tangy” while another noted it as “slightly citrus-y, with more chili taste.” Another said, “really liked the spice of this. I couldn’t believe how much variation and flavor differences existed between the different mixes. 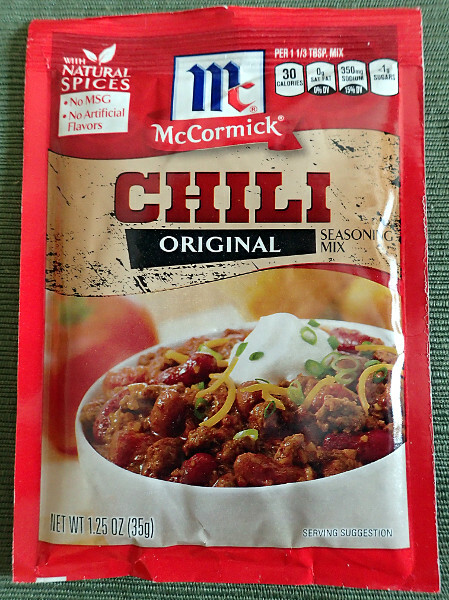 We declared two champions,but this isn’t a comprehensive assessment of all available chili seasoning mixes. It’s just the first in a quest to find the best one. In this case, you have the best two! There’s little doubt that the best chili comes from using pure chili powder and cooking it low and slow, but in a pinch we all could use some help with dinner now and again. That’s where the good old chili seasoning mix packet comes in. 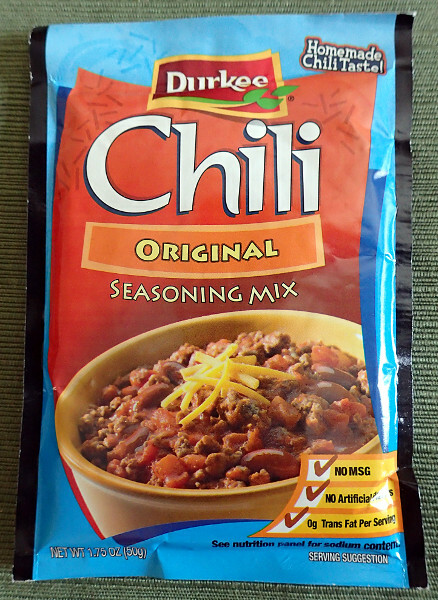 If you’re faced with the same choices at your grocery store, eSoupRecipes.com and its helpful chili tasters recommend French’s Chili-O Seasoning Mix or Durkee Original Chili Seasoning Mix. 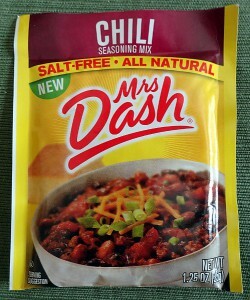 So tell us, what is your favorite chili seasoning mix? 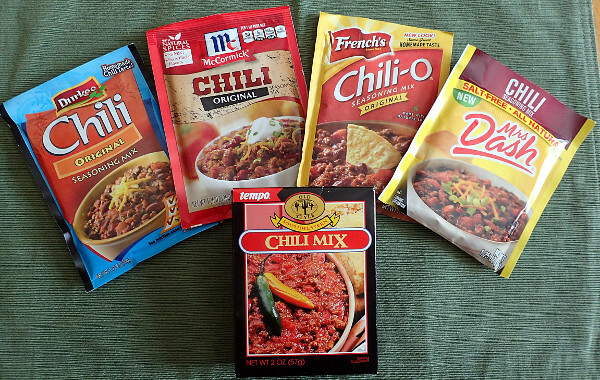 Which ones should we include in the next Chili Seasoning Mix Packet Showdown? 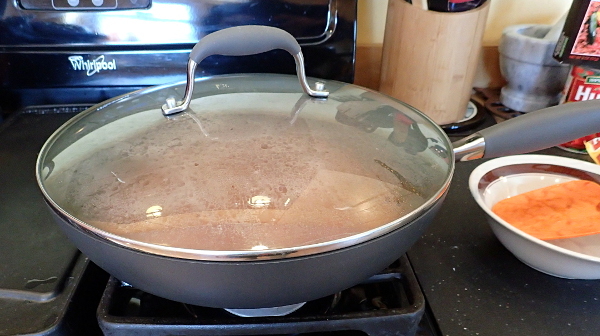 For smaller batches, the Unicook Dutch Oven 5 Quart model is my top choice for the money. You can get it for under $50 with free shipping. 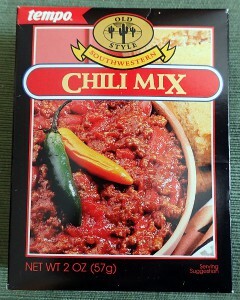 I have been making chili for 40+ years, the best chili mix that Ii have found is El Paso chili mix. I can not find it in stores in Florida and have had to have it sent to me from NH. 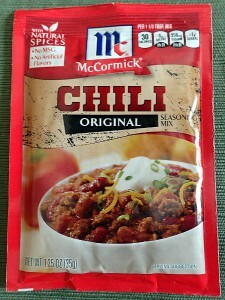 However, based on your review, I will try to find your two chili mix winners when making my next batch of chili. My favorite is Lawrys. It’s so easy to make I call it “Dump” Chili. 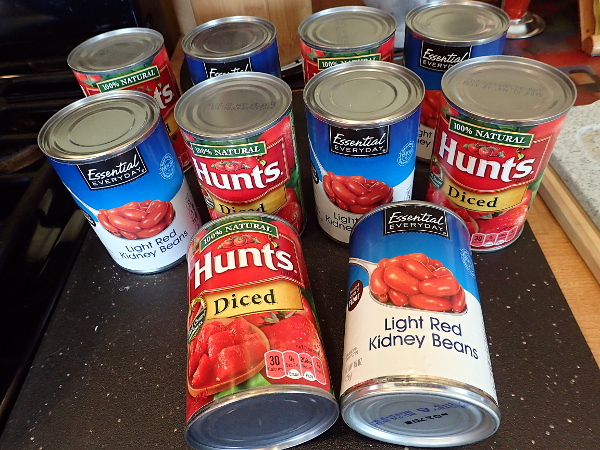 Dump 2 cans tomatoes, 2 cans of SW Red Kidney beans, ground Turkey and 1 pack of seasoning. To add spice to it simply add in a small individual pack of red pepper from any pizza place since it’s the perfect size. 20 minutes later you have great chili. The most important part is the tomatoes so they must be good ones. No cheap generic will do. 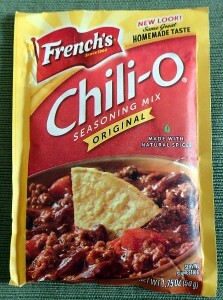 I have always known French’s Chili O mix to be the very best! I was raised with it. Sadly can’t find it in ANY stores near me. I had to resort to ordering it on line. I wish I knew why this happened??? Hi. Thanks for your comment. Yes, the same thing has happened here in northern Wisconsin. The grocery stores don’t carry French’s so I’ve also resorted to ordering the spice mix online. The most economical way for me is to buy the 21-ounce canister.